Remember this Insta from a couple weeks ago? I stopped by the Lela Rose boutique to check out Alan Anderson’s amazing jewelry and got to meet the designer – he’s so talented! All of his pieces are one of a kind and incredibly luxurious. He makes beautiful statement necklaces, chunky cocktail rings and cuffs, eye-catching earrings and the coolest brooches. Since I was planning to take photos anyway for the blog, Alan lent me this necklace to shoot! It looks lovely paired with my newest blazer, don’t you think? I love a good pinstripe. Minimal, classic and a little menswear-inspired. This jacket isn’t super expensive either, which is great! 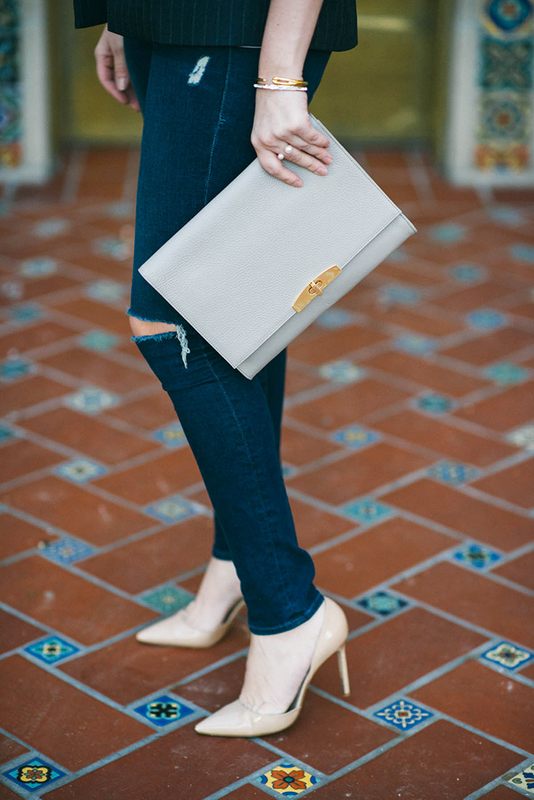 Now for the clutch – when I picked up my Cuyana tote last week, I also bought this oversized clutch in the same color. This stone shade is a real winner in my closet because it goes with everything! Neutrals. I can’t say it enough. It’s going to be a year-round staple for me for sure. A couple of other holiday gift worthy items from Cuyana include these gorgeous capes, the perfect overnight/weekender bag, and this initialed wallet. Don’t forget to send your loved ones a hint! 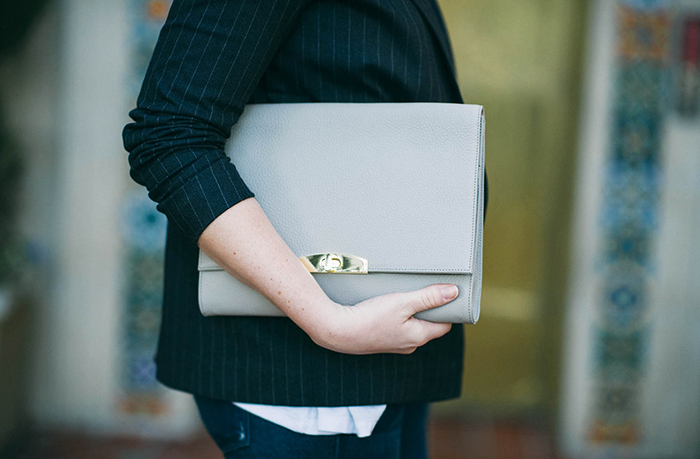 Pinstripe is always polished and chic. I love this jacket. The cut and the stripes make it look very chic! 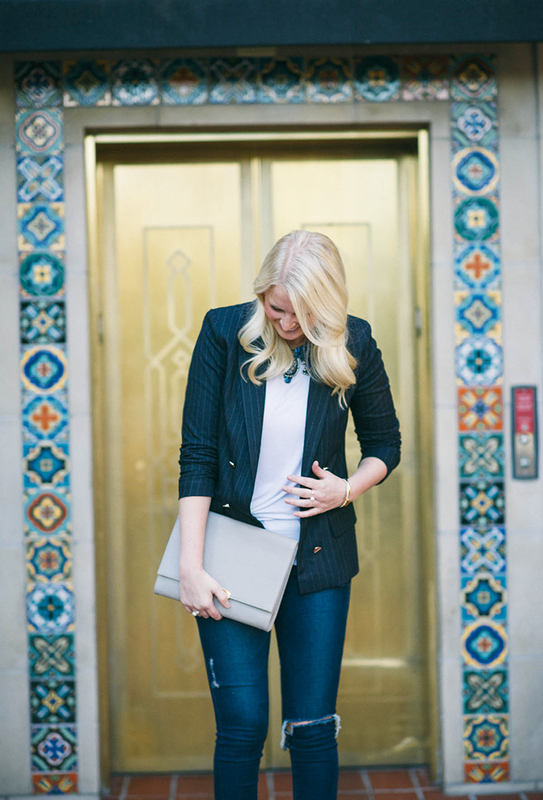 This blazer is stunning and fits you so well. This is a no-fail combination in my book – and the pinstripes are so chic! I love this polished, sophisticated look. That blazer fits you perfectly! This look is something I would absolutely wear…every piece of it. 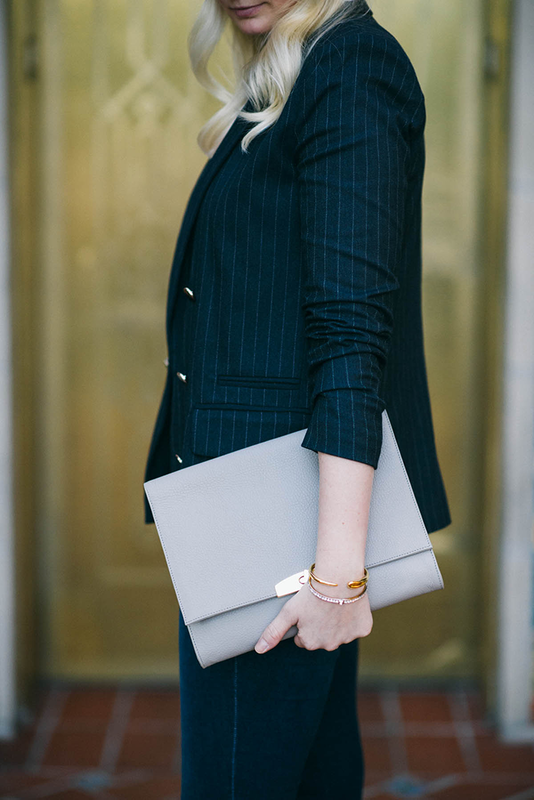 I love the classic pin stripe blazer, that necklace is stunning, and that Cuyana clutch is fab. I love that jacket! So chic! That necklace though, is amazing! Love the blazer! Such a versatile piece! such a chic, put together look! I’m loving that clutch! Pretty jacket and I love that necklace! Hope you have a great weekend! Nice blazer! Love your necklace too. 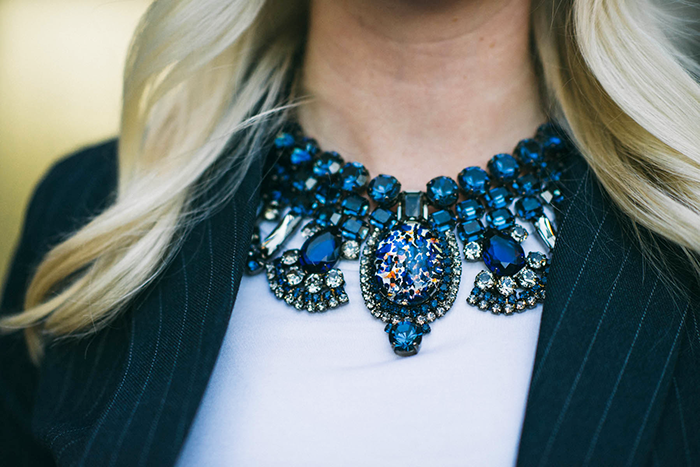 I love how you wore the blazer with that fun statement necklace. The clutch is beautiful. LOVE! The tailored / ripped jean combo is fierce!